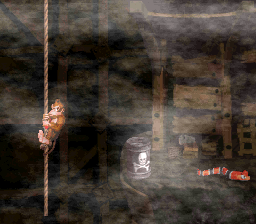 Misty Mine is a level in Donkey Kong Country. It's the third level of Chimp Caverns, coming after Manic Mincers. 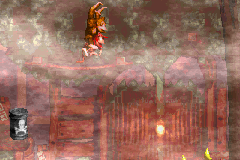 This stage is the namesake of its music theme, titled "Misty Menace". Diddy jumps above some Slippa enemies, carrying a TNT Barrel. Misty Mine is similar to the other mine levels, but with a catch; there's a light fog throughout the entire level. 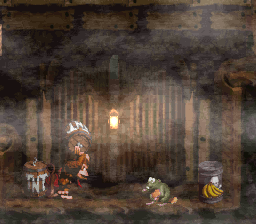 This fog shouldn't hamper Donkey Kong and Diddy Kong too much however. Aside from that, the level is for the most part just advancing right, grabbing ropes, and dealing with enemies that spawn out of the Skull & Crossbones Barrels. These barrels can spawn a couple of different enemies; those found in this level include Gnawty, Slippa, Klap Trap, and Army. Also in this level is a unique way to obtain all of the KONG Letters. By climbing down a long rope past the Star Barrel, a hidden bonus room can be found with all four letters, in addition to Expresso the Ostrich. He can be used to go faster, jump distances over the small enemies, and even render the Klaptrap harmless, due to his height. Expresso can be abandoned at a later point in the level to access a bonus room. In the Game Boy Color version, the "fog" is just a transparent white layer over the screen which gets slightly darker then lighter over time. 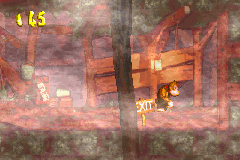 Completion of this stage unlocks the Funky's Flights of Chimp Caverns, and the next level of the area, which differs depending on which version of Donkey Kong Country is being played -- The Super Nintendo and Game Boy Advance versions have Loopy Lights as the next stage, and in the GBC version, a level exclusive to that edition, Necky Nutmare, is next. All enemies spawn indefinitely from Skull & Crossbones barrels unless the S&C barrels are destroyed via TNT. Expresso the Ostrich: His animal crate is found at the end of the first bonus room (with the "KONG" letters). Expresso, below an Expresso Animal Token. Rambi: Underneath a Skull & Crossbones barrel. TNT can be used to destroy the barrel. Expresso: Found high above a Klaptrap, and also after the first bonus room; Expresso himself can be use to reach it. An additional animal token of any animal can be earned in the second bonus room's mini game. K: Found at the top of the rope. O: Found at the bottom of the rope. N: Located at the top of the rope. G: At the bottom of the rope. Photograph: In the Game Boy Advance version, there is an obscure photograph to be found. After finishing the first bonus room with Expresso, leave and go to the top left platform; it is above the Skull & Crossbones barrel. This photo is usually completely out of sight otherwise. Diddy completes the "Find the Exit!" bonus level. 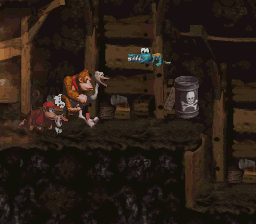 Find the Exit: After the Star Barrel, the Kongs must climb down a long rope to the already-opened bonus cave. All four KONG Letters are inside, as well as an Animal Crate for Expresso. 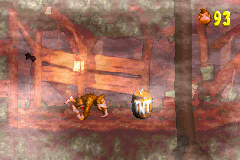 Stop the Barrel: After the first bonus, DK and Diddy will find a TNT Barrel. They must carry it over an oil drum into a low area, where they must use it on a right wall. A hole will blow open. Inside, the Kongs must match three animal tokens to win the token they matched. 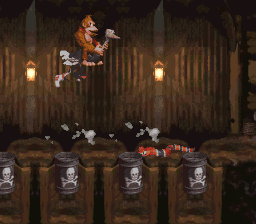 In the original Super Nintendo version of Donkey Kong Country, there is a glitch where the player can lose a life accidentally trying to grab the first rope. If the player chooses Diddy, does a Cartwheel and jumps just when the rope is offscreen, Diddy will fall through the floor and lose a life. Video of glitch. In the Game Boy Color version of the level, the "EXIT" sign is notably farther away from the actual exit than the two other versions. This page was last modified on 19 November 2016, at 15:04.